Yes, when we think of Cuba, we think of dancing the night away in Havana, vintage cars and cigars, but there is so much more. 100 Palms can set you up with an incredible and immersive journey through Cuba with a professional local guide, assistance with necessary documentation, insurance, money exchange and of course an amazing time. Currently we are selling tours through our trusted partner G Adventures. Please see an assortment of our favorite tours below. This incredible tour starts in Havana and takes you to Vinales where you will have free time to explore the town, go caving, hiking, biking or just relax and enjoy the beautiful views of the bay. Spend time in Maria la Gorda, a UNESCO beach town and then head to Las Terrazas and see the Roncali Lighthouse. 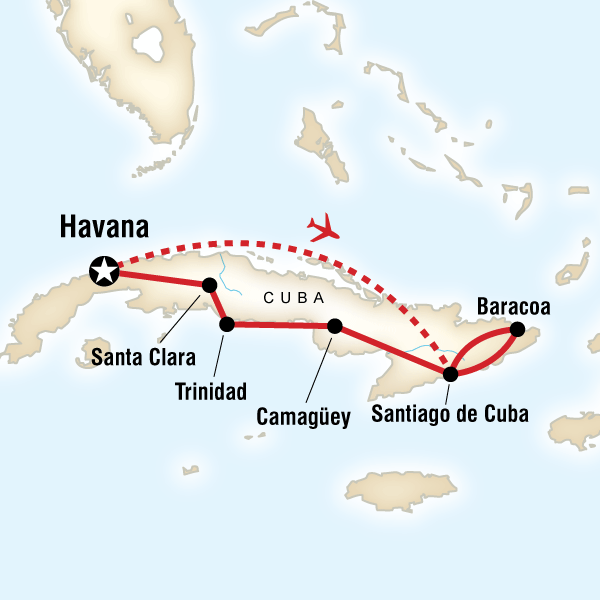 You will love the orchids, coffee plantations, cigar factory, a Havana orientation walk, and free time. Your tour includes a guide, all transportation, hotels and homestays, 7 breakfasts and much more. Airfare is additional. Give yourself a chance to see it all with this exciting venture through the entire country. Start your trip off right in Havana, then fly to Santiago de Cuba and take in an orientation walk with a visit to Castillo del Morro. Enjoy live music in this Afro-Cuban city. Next head to Baracoa and take a hike near El Yunque or explore the beautiful beaches. Take salsa lessons, see a waterfall, explore a mausoleum, go diving, see Old Havana and before you head home, you must of course spend the evening at a cabaret! Your tour includes a guide, all transportation, hotels and homestays, 12 breakfasts, 1 dinner and lots more. Airfare is additional. For those who love the open sea, try a sailing trip through Cuba, but not on the huge cruise ships, rather set sail in an 8 person catamaran. Spend your days sailing the Canarreos Archipelago, soaking in everything that these island communities have to offer. You can swim, snorkel, dive, relax at the beach, lay on the deck and spend time exploring these secluded, sparsely populated islands. Your tour includes a guide, skipper, chef, transportation on land, catamaran, 7 breakfasts, 5 lunches, 7 breakfasts and a lot of fun! Airfare is additional.